A couple of years ago, I purchased the tang in the attached picture. It was sold as a Lavender tang. Today, I noticed the white band on its tail. I don't think it's a Lavender tang. 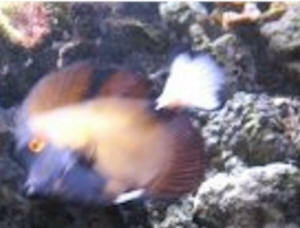 It has blue lips, blue stripes on its face, body, and fins, and yellow around its eyes. I'm worried that it is actually a Ring Tail tang. What do you think? My tank is 150 gallons. 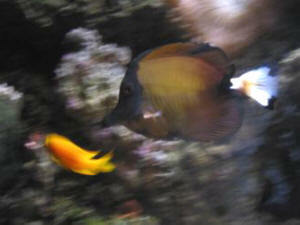 rare in the aquarium trade. I am lucky to have one! And It should be just fine in my tank. It's been very healthy and hardy, so far. Thank you, once again, for your help. I need an ID on this Ctenochaetus? Tang. Its around 2 inches in size and has no spots on its face. The pics attached are with and without flash. 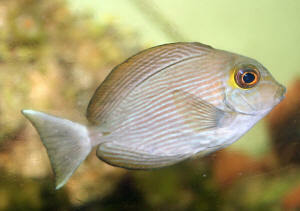 Do any of the Acanthurus have yellow around the eye as juveniles? This one does. These were collected off the South Western coast of India. Thanks Bob. I will look it up on Fishbase. 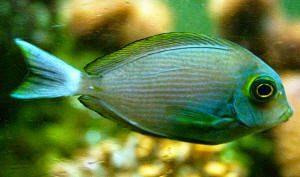 I sent the pics to a scientist at the Zoological Survey of India and she thinks its likely to be *Acanthurus xanthopterus*. I am looking for help identifying a tang I bought as a Gold Rim Tang. Looked up and doesn't really match. <I sure can Darren, what you have is a Tomini Tang. 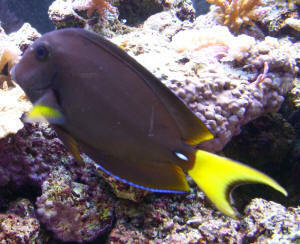 You may have been taken to the cleaners depending on what you paid for it, as a 2-3" Gold Rim Tang (Acanthurus nigricans) generally etails for about 70 bucks, while the same 2-3" size in a Tomini Tang (Ctenochaetus tominiensis) runs around 50 bucks keeping in mind that pricing will vary among etailers. 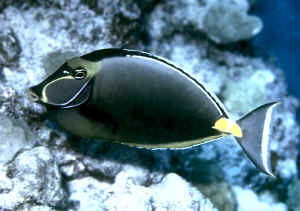 The Tomini Tang is relatively hardy and a little more disease resistant than the Gold Rim Tang, at least in my opinion/experience. paid about 25 pounds for when it was a little smaller. Very lively, inquisitive and active. Quick response genuinely appreciated knowing how many questions you must get. 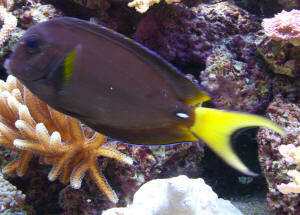 I would like some help identifying this Tang/Surgeonfish (attached). 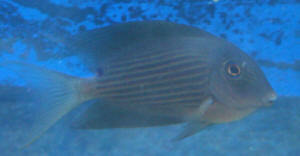 It was received with the simple name Purple Lineatus Tang, but no scientific name. I have attached two images. It's nearly impossible to take a picture of him. 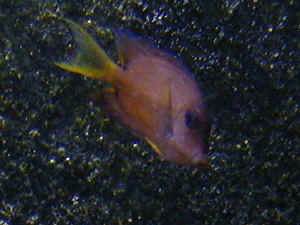 Re: mystery tang??? =( Hello!!! THANK you very much for the quick response, unfortunately I don't have any other images ...If you had to take a guess, what would you say? <Do you know where the fish was collected? 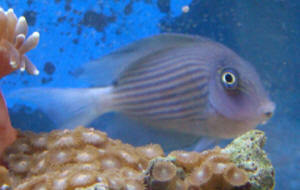 Please read here: http://www.wetwebmedia.com/zebrasom.htm> My friend who owns this tang would only tell me that its face would go blue when feeding and/or stressed ( apparently that was a big hint? lol)...I'm guessing that it might perhaps be some sort of hybrid? <Not a hybrid... as in a cross between species... likely a genetic mosaic however... a "Koi" variety... maybe of Z. flavescens.> Anyway if something comes to mind PLEASE let me know!! !